﻿ Ponycaps – Your Ponytail Has Been Liberated! *Ponycaps are now available for purchase at Runner’s High in Golden, CO. Located at 103 N. Rubey Dr. They have a variety of sparkle and regular Colorado Ponycaps. *Colorado Ponycaps are available for purchase through my Etsy shop. Please click on this link for an express route to my shop. Thanks, Michelle! What is a Ponycap? 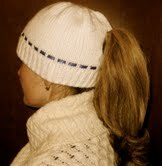 Well, a Ponycap is a knitted stocking cap with a fixed opening in the back for a ponytail to hang through. I have had long hair my whole life. I have always wanted a stocking cap that I could wear while my hair was in a ponytail. I never came across one in all my travels. One day I sat down and worked on figuring out how to knit a cap with a hole in the back. There was a lot of trial and error, some wisdom was garnered, and a few weeks later…voila, Ponycaps had arrived. Since then, I have received a Patent on the Ponycap. I’m happy to get the chance to share my Ponycaps with the world! And who knows, maybe one of these knitted hats could save you or a long-haired loved one from getting a cold. Maybe not, but if they have a Ponycap on, they’ll look cute even with the sniffles! Thanks for coming to Ponycaps.com. Be sure to check out my blog and enjoy your time here!